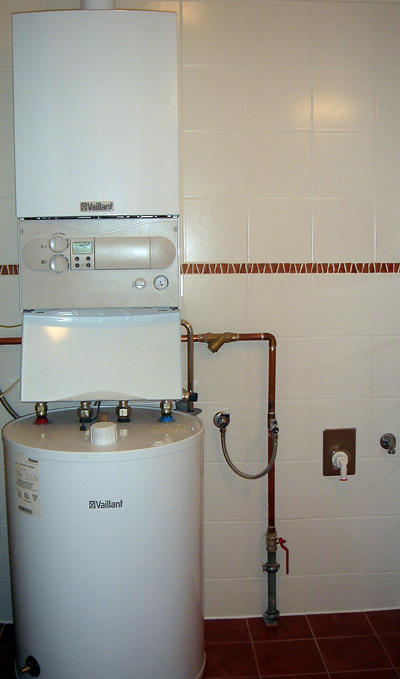 Commonly, there are three basic types of hot water heaters on the market: tankless (also called instant), solar (green building choice), and the conventional tank (or storage). The tank, or storage-type, can be fueled either by an electrical connection or natural gas. In this respect, it resembles a tankless water heater. When making repairs to a unit with gas connections, the work should be completed by your local gas company or a qualified and licensed plumber. Any connection or maintenance work done on gas connections by an untrained and unlicensed workman is hazardous and is quitemost likely in violation of local regulations and building codes. The non-tankless heater is a fairly basic appliance. The cold water enters the tank, where it is heated, and the hot water is stored until the demand comes from your bathroom tap or shower, or from your kitchen sink or dishwasher, or your clothes washing machine. Unless your home has a water softener system, either whole-home type unit or a dedicated model, sediment scale resulting from mineral deposits will accumulate in a honeycomb structure and at some point will restrict the amount of water that can be contained. The result? Inefficiency and your hot water will run out too soon. For an electric unit, turn off the power to your heater at the circuit breaker. For gas units, close the gas valve. Valve off your cold water supply to the unit. Allow plenty of time for the hot water to cool off. Connect a garden hose to the drain connection. Youll find it at the base of the tank. Route the other end of the hose out of your house. Turn the valve. Allow the tank to drain completely. Finally, open the cold water supply. Allow the unit to flush out until the water coming out the end of the hose runs clear and clean for a few minutes and then turn it off again. A common problem is improper heating. A licensed gas company representative or plumber should be called in for a natural gas heater. If you own an electric heater, First check the circuit breaker. It may have tripped; if so, just reset the breaker. If the breaker is in the On position but no current is flowing through it. This means the breaker itself is bad and needs to be replaced. You can check it with a voltage tester that is rated at at least 500 volts. Touch one prong of the tester to the terminal screw on the breaker and the other to the ground. If the tester doesnt light up, the breaker is defective and will need to be replaced. Many electric heaters have both an upper and a lower thermostat and heating elements. First attempt to reset your upper thermostat. If doing this doesnt cure the problem, use a digital multimeter to ensure the power is reaching the upper heating element. If its not, turn off all the power to the heater, valve off your water supply, drain the tank, and replace the thermostat. Another possibility is that your heating element itself has gone bad. A continuity test with your multimeter will reveal whether this is the case. The good news is that they are simple to replace. If your problem is still present, repeat the previous steps to test the lower thermostat and heating element. Banging and popping is generally caused by mineral scale deposits that build up over time on your heating elements. The best solution is removing and either cleaning them up or just replace them. Need a handyman? Find local unbiased reviews on the best handymen. Try Angies List.